WHERE IS THE MAT-SU VALLEY? The Mat-Su Valley is located in southcentral Alaska approximately an hour&apos;s drive north of Anchorage on the Glenn Highway and south of Denali National Park and Preserve. Mat-Su is an abbreviation for Matanuska and Susitna. Both are names of rivers in the area. "Matanuska" seems to be derived from Russian and was a term formerly used to refer to the Ahtna (Athabaskan) Indians of the Copper River region. "Susitna" is an Athabaskan word that is loosely translated to mean Sand Island River. WHAT IS THE AVERAGE SUMMER AND WINTER TEMPERATURE? Average summer temperatures range in the mid to high 60s and the winters usually range in the mid 20s. Layers, layers, layers! 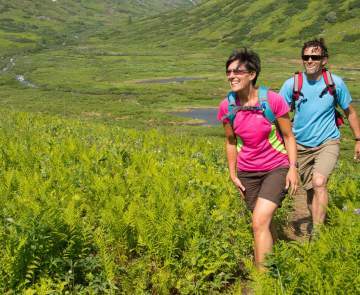 Even though summer temperatures can soar in the 70s and 80s, dressing in layers that are easy to put on or take off is essential for dressing in Alaska. You can purchase a fishing license at most grocer stores or retail shops throughout the state, but if you prefer to do so before arriving, log on to the Department of Alaska Fish and Game website and register online. HOW DO I GET TO THE MAT-SU VALLEY? Many visitors fly to Anchorage, rent a car and drive to the Mat-Su Valley. Visitors can also arrange for special shuttle pick-up and rent a car in the Mat-Su - primarily in Wasilla. The Alaska Railroad is another option with a stop in Talkeetna. For those with more time, The Alaska Marine Highway System (state ferry) is a great way to see Alaska&apos;s coastal communities as well as Alaska&apos;s interior. Take your vehicle with you on the ferry and drive the Alaska Highway to reach the Mat-Su Valley. WHAT IS THE POPULATION OF THE AREA? The population of the entire Mat-Su Borough (encompassing 23,000 square miles) is roughly 100,000. IS HATCHER PASS ROAD OKAY TO DRIVE? Hatcher Pass Road from Mile 1 to the Independence Mine Visitor Center is paved and easy to drive. The remainder of the road over to Willow has not been paved and is open to the public usually from the first week of July until early to mid-September when there is snowfall. WHAT IS THE CONDITION OF THE DENALI HIGHWAY? The Denali Highway is an unpaved highway with varying driving conditions. For the most up-to-date report on this and other highways in the state, call 511 or visit on the Web at 511.alaska.gov. I CAN SEE THE MATANUSKA GLACIER FROM THE ROAD - CAN I GET CLOSER TO IT? Absolutely! Access to the face of the glacier is at Mile 102 Glenn Highway through a private road operated by Glacier Park. There is an entrance fee based on the number of passengers. In general the northern lights or also known as the Aurora Borealis can be seen during clear, dark evenings typically from September through April. For more information about this natural phenomenon and to view an aurora activity forecast, visit the University of Alaska-Fairbanks Geophysical Institute website. I NOTICE A LOT OF THE ATTRACTIONS AND TOURS ARE CLOSED BY SEPTEMBER 15. WHAT IS THERE TO SEE AND DO AFTER THAT TIME? Although it is true that many vendors are closed after September 15, there are still plenty to see and do. For example, flightseeing, touring on ATV, hiking, visiting local museums are available after the summer season. Once the snow flies, winter activities in the Mat-Su abound. Take a dog sled ride, snowmobile, ski, snowshoe, ice fish, flightsee. WHAT OPTIONS ARE THERE FOR TAKING A TRIP ON THE RAILROAD TO THE MAT-SU? During both summer and winter months the Alaska Railroad has scheduled stops in both Talkeetna and Wasilla. There is flag stop service during the winter months along the main route from Fairbanks to Anchorage and limited flag stop service between Hurricane and Talkeetna during the summer months. For more information of times and flag stop procedures, contact the Alaska Railroad Corporation. WHAT ARE THE DATES OF YOUR MAIN EVENTS? Visit our Events section of the website to view dates of major events in the Mat-Su. I WANT TO SEE THE FAMOUS GIANT CABBAGES - WHERE CAN I GO TO SEE THEM? The best place to see Alaska&apos;s famous giant cabbages is at the Alaska State Fair&apos;s Giant Cabbage Weigh-Off Competition. Winners of this competition have easily weighed in excess of 90 pounds! If you&apos;re visiting the Mat-Su and can&apos;t make it to the competition, visit the gardens of the Palmer Visitor Center. Although these cabbages won&apos;t be at their peak weight, you can admire their large green leaves as well as other vegetables and flowers that grow in the Valley on display there. The Alaska State Fair also has amazing gardens open to the public during non-event days. I WANT TO GET MARRIED IN ALASKA. CAN YOU RECOMMEND SOME UNIQUE PLACES? Have you ever considered getting married on a glacier? 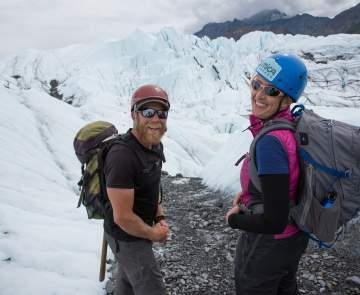 The Matanuska Glacier and the Knik Glacier are accessible and make a unique setting. Hatcher Pass or on one of the beautiful lakes makes a spectacular backdrop, too. How about on Mt. McKinley? Contact us for a Meeting Planner Guide to get you started on this exciting and important event. WE WANT TO SPEND A FEW DAYS IN THE MAT-SU. CAN YOU RECOMMEND LODGING OPTIONS? See our Lodging section for a listing of accommodations that can be sorted by category and region. You can find just about any type of lodging from small bed and breakfasts to large hotels and wilderness lodges. It depends on what you want to see and do. Approximately 80 percent of visitors to Alaska come during the summer months of June, July and August. Although many first time visitors to Alaska imagine the state to be frozen and dark most of the year, this is simply not true. Winter time temperatures vary depending on which region of Alaska you visit. In southcentral Alaska the average winter temperature hovers in the mid 20-30s. There are several exciting winter events that happen throughout the state as well.